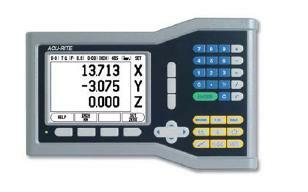 The Acu-Rite VUE 606109-01 Digital Readout (DRO) is for 1-axis grinding and general use. The most cost effective, entry level digital readout system that incorporates LCD display technology, the VUE offers many popular features and versatile software to accommodate milling, turning and grinding applications. Designed and manufactured in the USA, ACU-RITE readouts are the first choice of machine tool builders and users alike. Human verification (required): 4 + 7 = ?